Nowadays, people are becoming increasingly aware of the health concerns linked to the use of pesticides. “Pesticides are chemicals used in agriculture to protect crops against insects, fungi, weeds and other pests. In addition to their use in agriculture, pesticides are also used to protect public health in controlling the vectors of tropical diseases, such as mosquitoes. Researchers have found that baking soda is a versatile product that can offer a myriad of health issues, and among them, it can successfully get rid of up to 96% of pesticides from fruit and vegetables. Additionally, studies have shown that it is even more effective than standard bleaching procedures, as it is a highly alkaline product that neutralizes chemicals and pesticides by breaking them down into molecules. A team of researchers at the University of Massachusetts conducted a study on the effects of baking soda on gala apples. The apples were treated with two of the most common pesticides to the apples, phosmet, which is a known insecticide, and thiabendazole, a fungicide that has been found to penetrate apple peels and were afterward rinsed with three liquids. The first one was tap water, the second a 1% baking soda/water solution, and the thirst was the most popular bleaching solution, approved by the United States Environmental Protection Agency. 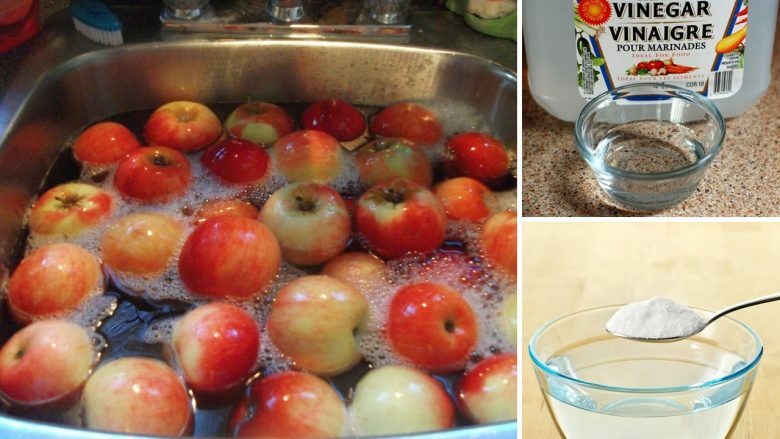 The results showed that the second solution removed the most pesticide residue from apples, even though it took it 12 to 15 minutes to fully eliminate all of them. This powerful, eco-friendly produce wash will cleanse the fruits and vegetables and lower the risk of health issues due to the use of pesticides. All you have to do is to add a few tablespoons of baking soda to a bowl of water and place the produce in the solution to soak for a few minutes. Rinse with cold water. Moreover, you can even scrub them with a bit of baking soda. Simple, but genuinely beneficial and powerful! -- Grow your own produce or buy organic and locally grown fruit and vegetables.